Benny Heifetz is one of the most promising artists in the world of Judaica. His special contribution to the sphere of Jewish Art is the development of the state-of-the-art techniques, combined with singular ideas in designing ritual objects for use in carrying out religious commandments, all of which have earned him the esteem of connoisseurs in this domain. Born in Jerusalem, Benny is descended from a family from the village of Peki’in, who had lived in the Land of Israel since the days of the Second Temple. During the years 1990-1991, he studied the silversmith craft as an external student at the Bezalel Academy of Art and also trained under the guidance of Zelig Segal, Benny Bronstein and Vered Kaminski. 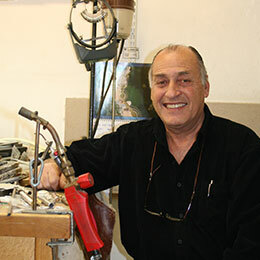 Several years later, Benny eventually opened his own gallery in the Jewish Quarter of the Old City of Jerusalem, where he developed his own unique artistic language . He excels in his work, sparing no effort to achieve perfection. An all-encompassing view is manifested in his creations, which are inspired by Jewish tradition on the one hand, and his experience in the field of precision mechanics, on the other hand. Benny also creates several series of pendants on Jewish themes, as well as other contemporary jewelry. His ceremonial objects and designs have gone on show at Judaica exhibitions and have been acclaimed in Israel and abroad. Copyright © BENNY HEIFETZ - CONTEMPORARY JUDAICA AND JEWELRY, All Rights Reserved.